All marks have a default color, even when there are no fields on Color on the Marks card. For most marks, blue is the default color; for text, black is the default color. Also see Assign colors to marks and Example – Multiple Fields on Color. 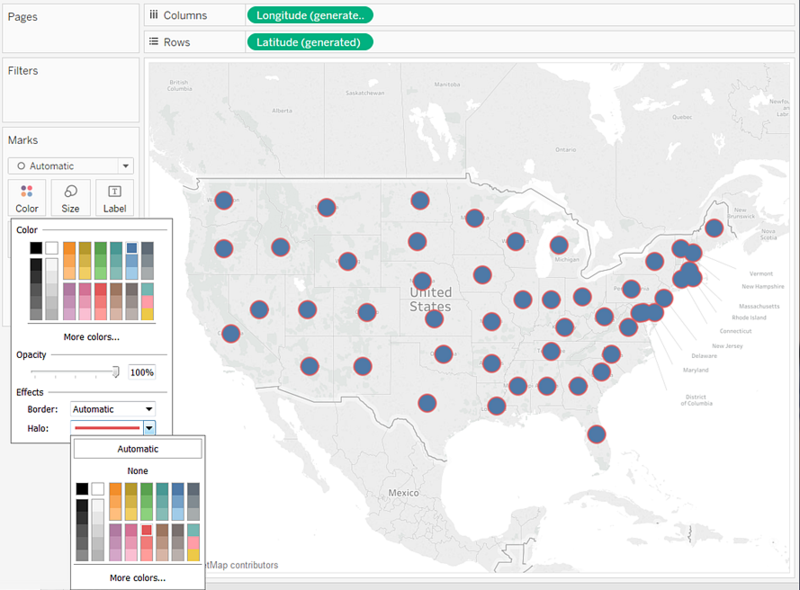 When you drop a field with discrete values (typically a dimension) on Color on the Marks card, Tableau uses a categorical palette and assigns a color to each value of the field. Categorical palettes contain distinct colors that are appropriate for fields with values that have no inherent order, such as departments or shipping methods. 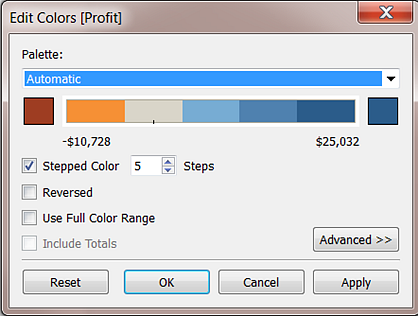 To change colors for values of a field, click in the upper-right corner of the color legend. 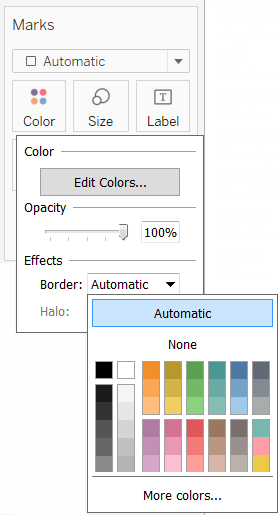 In Tableau Desktop, select Edit Colors from the context menu. In Tableau Server or Tableau Online, the Edit Colors dialog opens automatically. Click on an item on the left, under Select Data Item. Click a new color in the palette on the right. 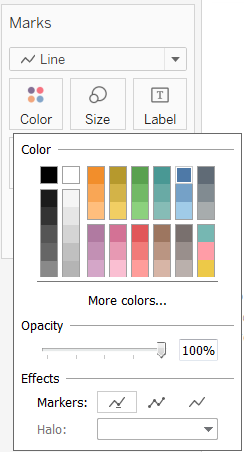 In Tableau Desktop you can hover over a swatch to identify the color. Repeat for as many values that you want to change. 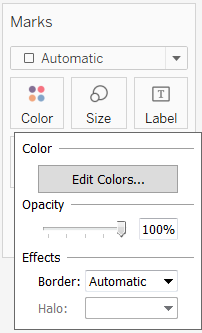 In Tableau Desktop, click OK to exit the Edit Colors dialog box. In Tableau Server or Tableau Online, simply close the dialog box. The Select Color Palette drop-down list in the Edit Colors dialog box provides color palettes that you can use for discrete fields. The list contains both categorical and ordinal palettes. At the top of the list are categorical palettes, such as Tableau 10. As noted above, categorical palettes are appropriate for discrete fields with no inherent order. At the bottom of the list are ordinal palettes such as Orange. Ordinal palettes contain a range of related colors and are appropriate for fields that have an associated order, such as dates or numbers. After you select a palette, click Assign Palette to automatically assign the new palette colors to the members in the field. To return to the Automatic palette and the default color assignments, click Reset in the Edit Colors dialog box. When you drop a field with continuous values on the Marks card (typically a measure), Tableau displays a quantitative legend with a continuous range of colors. You can change the colors used in the range, the distribution of color, and other properties. To edit colors, click in the upper right of the color legend. 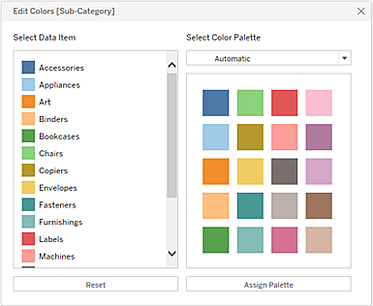 In Tableau Desktop, select Edit Colors from the context menu. In Tableau Server or Tableau Online, the Edit Colors dialog opens automatically. When there are both negative and positive values for the field, the default range of values will use two color ranges and the Edit Colors dialog box for the field has a square color box on either end of the range. This is known as a diverging palette. When all values are either positive or negative, the default range of values will use a single color range and the Edit Colors dialog box for the field has a square color box only at the right end of the range. This is known as a sequential palette. 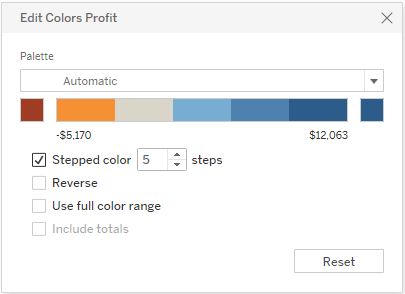 You can specify whether Tableau uses a diverging or a sequential palette for a continuous field on Color, and also configure the range of colors for the field’s values. All palettes with Diverging in the name are diverging quantitative palettes—for example, Orange-Blue Diverging. You can choose a diverging palette for any continuous field—it isn’t necessary for the range of values to contain both positive and negative numbers. 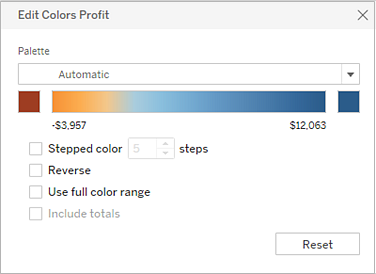 In Tableau Desktop, in the color configuration dialog box (which is part of your computer’s operating system), select a color from the color picker or enter custom values. 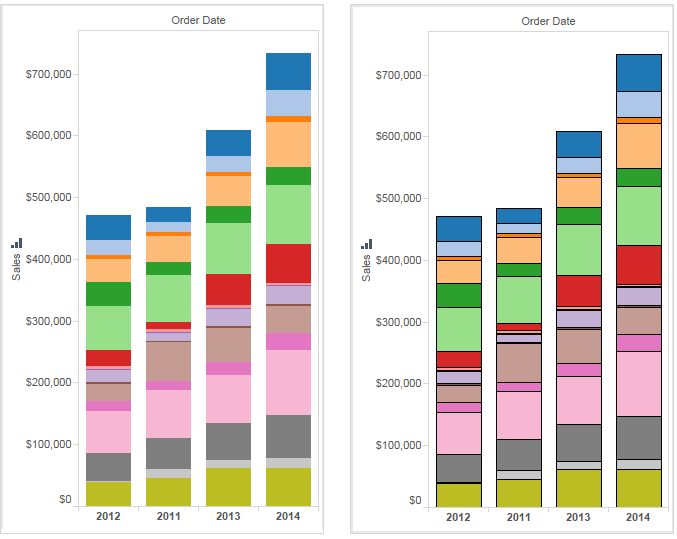 In Tableau Server or Tableau Online, enter a custom Hex value in the Custom Color field. If the value isn't valid, no changes are made. All other palettes are sequential quantitative palettes. 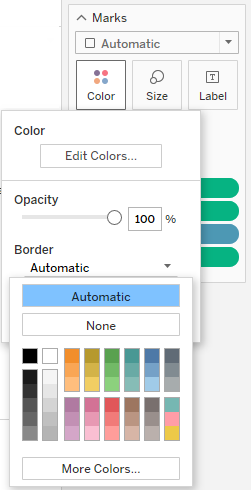 To change the colors for a sequential palette, click the square color box at the right end of the palette spectrum to either open the color configuration dialog box (Tableau Desktop), or enter a custom Hex value in the Custom Color field (Tableau Server or Tableau Online). 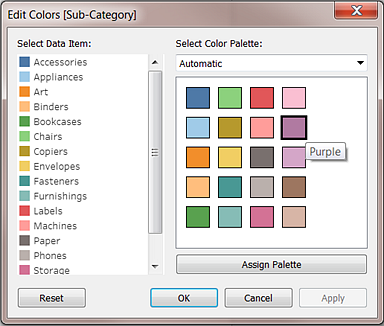 The following options are available in the Edit Colors dialog box for a continuous field. Note: Options differ where noted for Tableau Server and Tableau Online. Select Stepped Color to group values into uniform bins, where each bin is associated with a color. Use the spin control to specify how many steps (bins) to create. For example, for a range of values from 0 to 100 you could specify five steps to sort values into five bins (0-20, 20-40, etc.). If a diverging color palette is selected, the point where the palette transitions between colors is shown on the color ramp with a small black tick mark. When the number of steps is odd, the mark is placed in the middle of the transitional step. When the number of steps is even, the mark is placed at the boundary between the steps where the color changes. Select Reversed to invert the order of colors in the range. For example, if you want lower values to have a darker intensity in a sequential palette, reverse the palette. For a diverging palette, reversing the color palette means swapping the two colors in the palette, in addition to inverting the shades within each color range. 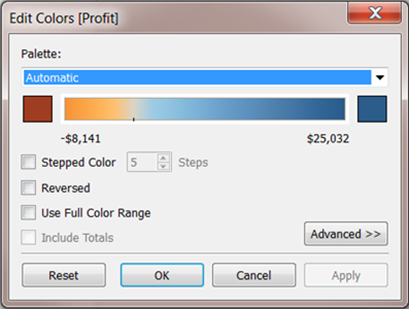 With a diverging (two-color) palette, you can select to Use Full Color Range. Tableau assigns both the starting number and the ending number a full intensity for both color ranges. So if the range is from -10 to 100, the color representing negative numbers will be adjusted to change in shade much more quickly than the color representing positive numbers. 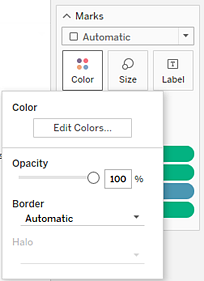 If you don't select Use Full Color Range, Tableau assigns the color intensity as if the range of values was from -100 to 100, so that the change in shade is the same on both sides of zero. This means there will be much less change on the negative side, where actual values only range from -10 to 0, than on the positive side, where values range from 0 to 100. The image on the left below shows a red-green diverging color palette for values from -858 to 72,986. Without using the full color range, -858 (associated with the small box at the lower right of the chart) shows as gray, because -858 is only about 1% as far to the negative side as 72,986 is to the positive side. When the full color range is used, as in the image on the right, -858 shows as a dark red, equal in intensity to the maximum positive value. 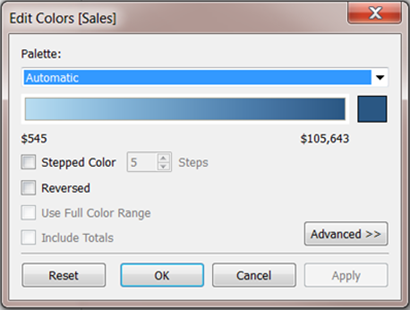 Select Include Totals to include totals, sub-totals and grand totals in the color encoding. This option only applies when total values are included in the view. 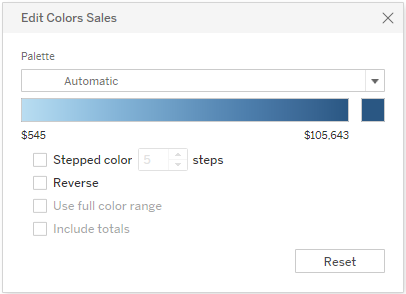 In Tableau Desktop, when you click Advanced in the Edit Colors dialog box, you can choose to specify the start, end, and center values for the range by selecting the check box and typing a new value into the field and the color ramp is adjusted accordingly. The Start value is the lower limit in the range, the End value is the upper limit, and the Center value is where the neutral color is located on a diverging color palette. Note: If you are in web authoring mode and click Reset, the color palette will return to the default settings. Any options that were set in the Advanced option will also be reset. To undo this action, you can click Undo in the top menu. If your changes have already been saved, you must change the Advanced options in Tableau Desktop and republish the view. Click the Color drop down on the Marks card to configure additional Color settings not related to the actual colors shown. Modify the opacity of marks by moving the slider. Adjusting opacity is especially useful in dense scatter plots or when you are looking at data overlaying a map or background image. As you slide the slider toward the left, marks become more transparent. By default, Tableau displays all marks without a border. You can turn on mark borders for all mark types except text, line, and shape. On the Color drop-down control, select a mark border color. Borders can be useful for visually separating closely spaced marks. For example, the views below show a scatterplot with mark borders turned on (left) and turned off (right). When borders are turned on, marks are easier to distinguish in areas where they are tightly clustered. Note: You can also use the opacity setting to show the density of marks. When you are viewing a large number of color-encoded small marks, it is usually better to leave mark borders off. Otherwise borders can dominate the view, making it difficult to see the color encoding. For example, the views below show bars that are segmented by a large number of color-encoded dimension members. With mark borders turned on (right), some of the narrower marks are difficult to identify by color. With borders turned off (left), the marks are easy to distinguish.